I was going through old pictures because my dad isn't doing too good, and discovered this one. Probably 1988? Fred Bear compound that spontaneously shattered in the sunlight while laying in my Dad's truck seat one cold February day. The store replaced it and I eventually gave it to my young nephew years later. Needless to say, those heavy aluminum arrows didn't shoot very far. No idea where mine would be, but he's Ryan's first ever shot of a suction cup arrow with a bow. Better cameras then too. All the new one make by hair look gray. This photo taken about 1947 or '48 in Virginia. My sister, my dog, and I with probably my first bow,...made by my dad. I was 4 - 5 years old. My first bow kill - 1978? I wish I still had the photo I’m thinking of .... It was 1981/82 I was standing on a cliff in Jersey city New Jersey with my bear T/D limb resting on my toe . I was looking out over the train tracks that ran into NYC and out in front of me were the Twin Towers... In hind sight I wish I had made an attempt to keep that picture... imagine this photo with The World Trade Center out in the distance. Those old pics are great to look at. Mine from the 60s are at my moms. Great thread. My 1st Deer Oct 4th 1958 & Illinois 2nd ever Deer Season. 45# 64" Eddings Recurve. Haha....HUNT still makes that same face! 1957. Youth tag:). Spot and Stalk, DIY, Public land. Ha!! They didn't have cameras when I started. Me on the right. Probably 18 or 19 years old. 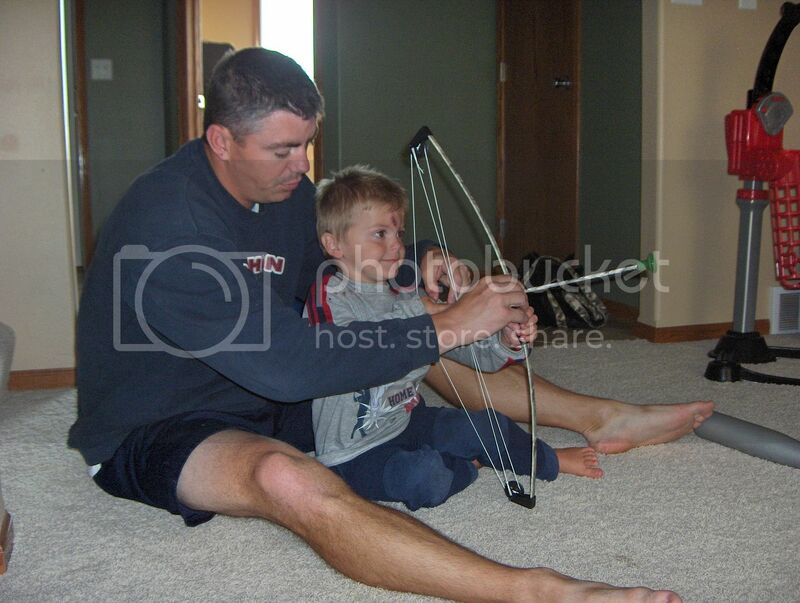 Bowonly, Another bowhunter indoctrinated by Ishi...after he put on a few pounds. Great photo! Great pics. Hunts is too funny! Hunt that doesn’t look like a Georgia buck. I have no pics of me but here's one of my daughter. I was late to the party. Just a few years ago. My first mule deer. Better late than never Dutch! You made up for lost time with that mulie!! My first big game taken with a bow, a small mule deer buck and javelina. I took them about 15 minutes apart using the same arrow, by accident. That hunt was the subject of the first outdoor article I ever had published. Don't have any of myself, but my son started around age 5...give or take. I know I have some pictures from at least a couple of years earlier of him with a bow in hand but can't seem to find them on this computer. I know that my mom has a picture of me at about 4 or 5 standing beside her with a bow in my hand. A bit of a ways away to get it though. The wife getting the grandson lined up! Got a few in the pig! We created another monster with this one! My first bow was for shooting carp from the Lake Erie marches in the 1950s but it was not until 1962 I killed my first deer while stationed in the Air Force in the UP of Michigan.